For Steve’s one-week-early birthday meal at my mom’s I decided to make a marjolaine for our dessert. He’s a sucker for anything with dacquoise or choux paste so of course I wanted to include at least one of those components in his celebration dessert. Since we won’t be in GR on his actual birthday, Mom hosted us, along with cousin Clark, for a repast of her famous Swiss steak, cheesy potatoes, green beans and crunchy cole slaw. What a great way to launch a birthday week, eh Stevie? A classic marjolaine is a layered, flourless dessert consisting of rectangles of nutty meringue (dacquoise) layered with ganache and pastry cream or buttercream. Once assembled it’s finished off with a coating of ganache or buttercream along with sliced almonds pressed onto the sides for garnish. Some flavors that are popular with the dark chocolate ganache are hazelnut, coconut, coffee or pistachio. In my case chocolate and hazelnut were the choices, particularly since I had some of my homemade praliné in the fridge. The plan: three layers of toasted hazelnut-topped dacquoise sandwiched with whipped dark chocolate-praliné ganache and garnished with Chantilly, dacquoise kisses and more ganache. I opted for the rustic approach without the finish coat. A quick note: my marjolaine became “floured” due to the addition of chocolate shortbread crumbs as one of my layers - omit that component and it is indeed flourless! In preparation for dacquoise baking I used my 4” x 11” tart form to outline my rectangles - just place the form on the Silpat, dust powdered sugar over, lift off the form and voilà - the shapes are there as simple templates for the dacquoise. Cool. I had enough batter for the three rectangles plus some leftover for petite kisses. Awwwww. Before baking I sprinkled chopped hazelnuts on top along with a generous dusting of powdered sugar. Dacquoise bakes at 350ºF for about 20 minutes. My version is a soft meringue - I look for lightly browned and set rectangles. For the ganache I put 100 g dark chocolate pastilles in a heatproof bowl, brought 250 ml heavy cream to a boil, poured it over the chocolate, blended until smooth and then added 50 g (about 15% by weight of the ganache) of praliné (caramelized hazelnuts processed to a paste). Pop it into the fridge to chill before whipping it up for the layering portion of the program. I had plenty of ganache for this purpose - good for perhaps some petite tartelettes or profiteroles. One rectangle of dacquoise down, ganache spread over it, then my chocolate crunchy crumbs (my favorite chocolate shortbread dough baked into crumbs) sprinkled over that. Another layer of dacquoise then ganache then crumbs and so on. To top it off I piped some Chantilly cream “pearls” along the length with swirls of ganache down the center and popped some of the dacquoise kisses right down the middle. We enjoyed simple slices for the birthday dessert. Light, airy, delicious! Enjoy spring and here’s to lots of May flowers coming soon! And as always - happy baking! Better late than never, it’s high time I sent welcome-to-spring wishes to everyone. Even though we actually had a bit of SNOW! the other evening, we’re seeing green shoots coming out of the bare ground and some tree limbs showing their first hints of leaves. We’ll take it! It seems life has a way of carrying us onward, often to the point of prompting us to ask “what I have been doing these past few weeks/months? !” While I don’t have a specific recipe or new project to share with you on the blog this time around, I thought it would be nice to show you what I’ve been up. Oh - news flash! I’ve finally added a search box in the blog’s sidebar so you can type in key words, e.g. “croissant”, and find posts I’ve written on that particular topic. Cool! Next up is my new favorite version of financier, those delightful teacakes that I love so dearly. This one is coffee hazelnut, dipped in dark chocolate ganache and topped with chopped toasted nuts. SO GOOD. I simply cannot ignore fresh fruit tarts - they always make me smile! These contain a baked ricotta custard/vanilla scented filling - deelish with fresh berries. 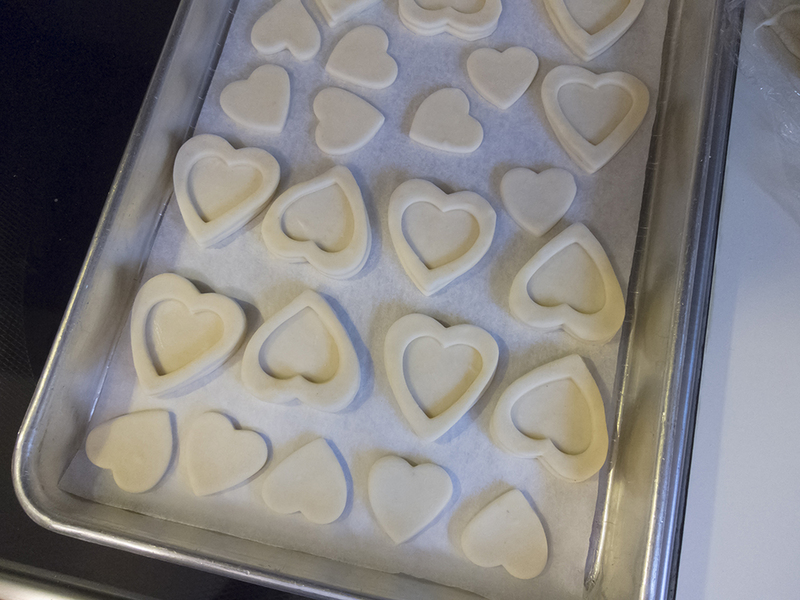 Current shortbread flavors, all tubed up! Another thing that keeps me busy involves planning and preparing for my classes at Sur La Table in Grand Rapids. Things like figuring out the best way to set up the class for optimum hands-on experience, determining quantities of dough that might have to be prepped ahead for topics like croissants or artisan breads, orchestrating a smooth flow to the class with delicious baked goods as the end result. What’s not to like. Below is a test I did for a no-knead rustic bread baked in a Dutch oven style enameled cast iron pot. The loaf on the right was done in a gorgeous Le Creuset 2.25 quart lidded saucepan (sorry the lid is missing from the picture!) and the one on the left on a sheet pan. Not only the rise but the crusty, golden, shiny surface of the one from the cast iron pan can’t be beat! NOTE: one pound of dough worked very nicely in this size pan, the taller sides giving just the right lift to the dough. There’s lots to be learned. Check out the class calendar on Sur La Table’s website for all sorts of topics, both savory cooking and baking/pastry classes. There are a number of chef instructors, myself included, just waiting to share their knowledge with you. Ladyfingers (biscuit à la cuiller en Français) are just one of the components of a classic charlotte russe, a dessert created with the finger-like sponge cakes as a border, filled with a fruited bavarois and often garnished with crème Chantilly and fresh fruit. Raspberry and pear are two of the commonly used fruits for this particular delight. Having recently been asked to make the raspberry version for a birthday dinner party for 10, back to the recipe file I went to review the various options for creating the dessert. Both Le Cordon Bleu’s pear charlotte (from my basic pastry classes there) and Michel Roux’s raspberry charlotte served as the springboard for my decisions. Believe you me, there are lots of variations out there. I opted for a raspberry crème anglaise with added gelatin, blended with softly whipped cream (the makings of a typical bavarois). I went one step further and added some Italian meringue to boot, but you’d be happy with a bavarois by itself if you don’t want to fuss with the meringue part. Either way it’s a great combo! The filling (even without the Italian meringue) makes plenty for a 9” springform pan. Put any leftovers in ramekins, chill to set and top with fresh fruit, chopped toasted nuts, chocolate sauce or whatever for a lovely light dessert on the fly. But let’s take it a step back and review the process, OK? Ladyfingers are basically a sponge cake made with eggs, sugar and flour. The eggs are separated, the yolks are beaten with a portion of the sugar until blanched and thickened, and the whites beaten with the other portion of the sugar to stiff peaks (think meringue). The beaten whites are folded into the yolk/sugar mixture then the flour is sifted into the whole shebang and folded in gently. The leavener here is the aeration created by all of that egg whipping. Here’s the printable ladyfinger recipe. Then it’s time for piping. Yay! Wanting to put a diagonal slant on my ladyfinger border, I penciled my template for piping onto parchment paper and turned it over so the marks ended up on the non-baking side. Pipe the lengths close together so once baked they meld into connected portions with which to line your mold. You can also see my base piece below. They get a decent dusting of confectioner’s sugar times two before going into the oven. The idea is that the powdered sugar beads and crusts up a bit in the oven. Bake them at 400ºF for 6-8 minutes et voilà! It takes a little planning to assemble the charlotte, particularly depending on what type of form or pan you have on hand. In pastry school one typically uses an open cake ring lined with acetate film but I opted for the ring portion of my 9” springform pan lined with a parchment collar. One of the great things about this dessert is its make-ahead-ability. It can be fully assembled and kept in the fridge for a couple of days or frozen for a week before your planned event. Just bake the ladyfingers and base, line your mold with the powdered sugar side of the sponge cakes facing out and hold it in the freezer while making your filling. Once filled, fridge it for a day or two ahead or freeze for a week if need be. It’s a beautiful thing. The final garnish can be completed the day you plan to serve. As you can see below, I tucked scraps of sponge cake along the inside bottom edge and where the ladyfinger borders meet to provide a secure cocoon for my raspberry filling. For just a little something extra I arranged fresh raspberries on the bottom. Having completed my filling of raspberry bavarois lightened with Italian meringue, I poured it into my ladyfinger-ed mold almost to the top. Just remember - due to the timing of adding the gelatin and cooling the crème anglaise to just the right temperature for adding the whipped cream and Italian meringue, it’s imperative that your border and base are at the ready. Once the filling is in it’s simply a matter of chilling the whole thing and letting the filling set. 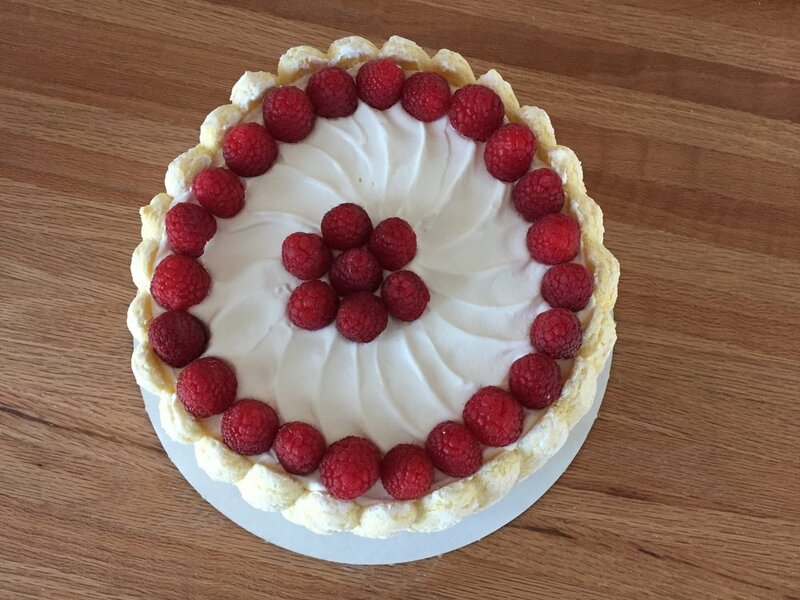 A final topping of crème Chantilly and fresh raspberries, and you can call it a day! Since I made this for someone else’s party, I couldn’t slice into this baby right then and there to show you a cut section. Buuuuut . . . . I certainly did taste some ladyfinger scraps with a bit of the bavarois filling, and I say yes indeed! Yes, I admit that I love delicious brioche, both making and eating it. Even though there’s a good deal of butter and egg in this enriched dough, if the base recipe is just right and the process is executed just so, it’s a real winner in my book. Light and pillowy with a tight yet soft crumb, it’s a canvas for so many different creations. I’ve written about brioche in the past, but I’m one of those folks who loves to peruse recipes, compare and tweak the ingredient ratios as well as the methods used to produce some version of this particular delight. Knot rolls coming up! This time I had citrus (orange to be exact) on my mind. During the winter months I often have a mix of orange segments with their juice plus some cut-up apples in a bowl in my fridge for that all important daily fruit quotient that we all need. Not wishing to waste any part of the orange, I zest my oranges before segmenting them, then wrap the zest in little packets, stashing them in the freezer so the zest is handy for my next citrus baking adventure. I reviewed Dorie Greenspan’s brioche recipe in her book Baking Chez Moi in addition to Jeffrey Hamelman’s in his book Bread - A Baker’s Book of Techniques and Recipes. While there are tons of recipes out there for brioche, what I took away from this review was one small interesting technique that Hamelman recommends when using a planetary stand mixer (like the ubiquitous Kitchenaid that many of us have). He notes that it’s more difficult to adequately develop the dough in a planetary mixer so suggests holding back half or more of the sugar at the beginning of the knead. Sugar is hygroscopic and actually acts as a liquefying agent, so if it’s all added at the beginning, the result is a looser textured dough that doesn’t develop as well. Who knew? Learn something new everyday. NOTE: if you’re interested in a quick run down on planetary (most commonly used) and spiral mixers (more specifically for bread and artisan dough) check this out. The mixing process went well, the resulting dough had that silky, buttery texture one hopes for before the overnight refrigeration, and the following morning the division and shaping proceeded apace. I divided my dough into 42 g / 1.5 ounce portions, did the preliminary ball shaping and gave them a 10 minute rest. One of the important steps in the brioche making process is the final rise - if it’s too short, the end result isn’t that wonderful light, airy and oh-so delicious creation on which you’ve spent a decent amount of effort. Especially during the winter months in my 69º kitchen, I’m careful to give the dough plenty of time, sometimes up to 2 hours, for that all important rise. Note that since brioche is such an enriched dough, the rise may not be as obvious as that of lean breads, but you should be able to appreciate the increased fullness and puffiness of the risen dough. These baked at 375º F for about 20 minutes - all nice and golden brown. Once cooled I opted for an orange cream cheese glaze that set these babies off with just the right touch. Delicious. Soft, delicate crumb, light and wonderful. Here’s the recipe for my orange brioche dough, yield 1320 g / approximately 2.9 lbs. Place flour, milk, water, eggs, salt, yeast and half the sugar in the bowl of a stand mixer fitted with the dough hook. Mix on low to incorporate then knead on speed 2 for 5-7 minutes until you have a strong dough using the windowpane test. Add the second half of the sugar and knead for 2 more minutes. Add butter bit by bit on speed 2. Once all added, knead for 8-10 minutes until the dough cleans the sides of the bowl and sheets nicely. Place the dough in a lightly floured bowl, tuck plastic on and around the top and let it rest for 1 hour at room temperature. Fold the dough gently, place it back into the bowl, cover with plastic wrap and refrigerate. De-gas 2-3 times over several hours then refrigerate overnight. Proceed with dividing and shaping as noted above . For these orange rolls I divided the dough into fifteen 42 g portions, using about half the dough (a full batch would give you 30 rolls!). You don’t have to use all the dough - just tightly wrap any unused dough with plastic wrap and freeze for later. Once the knot rolls are shaped, cover lightly with buttered plastic wrap and let rise 1.5-2 hours depending on the temperature of your kitchen. Heat the oven to 375ºF and bake for approximately 20 minutes until golden brown. For the icing I blended 227 g / 8 oz softened cream cheese, 2 T corn syrup, 2 T heavy cream, 75 g / 3/4 cup confectioner’s sugar, 1 tsp vanilla, pinch salt and the zest from one medium orange. You may not need all of it - it keeps in the fridge, covered for a week or so. I used my leftover glaze on some petite citrus financiers. Deelish. Now go have some brioche fun! A big thanks to our Rhode Island friend Gigi for sending me the link to the NYT recipe from Alison Roman for these addictive buttery, crispy, chocolate chunky shortbread cookies. Right up my alley! I did tweak the recipe a bit as I am wont to do, using dark instead of light brown sugar, reducing the total sugar a bit and subbing in some whole wheat pastry flour for a portion of the all purpose flour. I love the nutty, caramely-ness of the end result. Yummy. While Alison’s process involves shaping the dough into two logs, chilling then rolling in demerara sugar and slicing, I opted to wrap my dough in discs, chill then roll out and cut with my favorite fluted round cutter. A sprinkling of flaked sea salt and raw sugar on top adds a wonderful crunchy component. Beat the butter and sugars in the bowl of a stand mixer with the paddle on medium high for 3-5 minutes to lighten and fluff-en it up. Scrape down the sides of the bowl, slowly add the flour followed by the chocolate and mix until blended. Divide the dough into two or three portions, wrap in film wrap and chill about 2 hours. Note: hold the dough well wrapped in the fridge for up to a week or in the freezer for a couple of months. Line sheet pans with parchment and heat oven to 350ºF. Roll the dough out on a lightly floured surface and cut shapes of choice. Sprinkle tops with raw sugar and flaky sea salt. Continue to roll/cut scraps or wrap and freeze any leftover dough for later. Put sheet pans in the freezer for 10-15 minutes before baking. Bake until lightly browned, 12-15 minutes. Cool and enjoy! As I experiment more and more with whole grain flours, I just had to do a trial of croissant dough with a couple of variations on using whole wheat flour. Just can’t get enough of the laminated dough thing, or so it seems. Oh well, there are worse things to be fixated on, don’t you think? The first version adjusts my base recipe from 450 g all purpose flour and 50 g bread flour (recipe coming at the end, I promise!) to a mixture of 300 g spelt flour and 200 g whole wheat pastry flour, both from Bob’s Red Mill. The spelt I used is a coarse grind and gave my dough a speckled look. 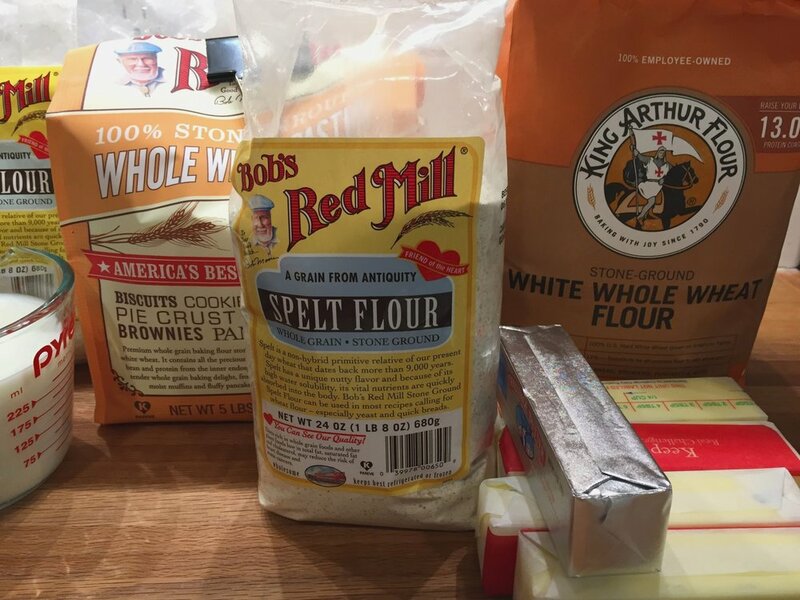 I was hoping that my choice of those two flours would sort of balance each other out in terms of gluten content, giving me something closer to all purpose but with the nutritional benefits of using whole grain flours. Kinda winging it here. The second version uses a mixture of 300 g white whole wheat flour from King Arthur (a finer grind than the spelt and a softer flour from soft white wheat) and 200 g whole wheat pastry flour from Bob’s Red Mill (another softer flour), yielding a smoother appearance with less speckling. Again - wingin’ it. I normally use whole milk for my liquid but this time I replaced about a third of the milk with water, thinking that the final, slightly less enriched, nutty-wheaty croissants would lend themselves to more savory uses like ham/cheese or chicken salad sandwiches. I know, I know - this isn’t a very scientific study since I’m changing a number of variables, but why not play around? It’s what I love. I put both versions through the usual steps of beurrage followed by three business letter folds (or 3-folds) and a final rest in the fridge before rolling out. I divided each batch into halves so I could create two different pastries with each version. The spelt dough rolled nicely but when it came time to cut and shape the croissants, the dough felt drier and was not quite as sturdy, tending to tear when being stretched a bit. With the second half of the spelt dough I did a savory spiral - rolled it out into a 10”x12” rectangle, brushed it with egg wash and sprinkled on mixed Italian herbs and grated gruyère cheese . . . .
rolled it up into a log and sliced ~1 inch slices. The slices went into buttered 80 mm rings to proof. The white whole wheat version also rolled out easily and was less inclined to tear when being stretched and shaped. The second half of this dough became cherry-almond spirals - same idea as the cheese/herb spirals above - spread on a mixture of almond flour, egg white and brown sugar and topped it with cherry preserves and sliced almonds. Rolled up and sliced, these went into buttered muffin tins to proof. I gave the croissants a good 2-2.5 hours to proof and the spirals a bit less. Then on to the bake! I gave the proofed cheese spirals a sprinkling of more cheese . . . .
and here they are all baked up! I gave half of the egg washed white whole wheat croissants a sprinkling of KAF’s Artisan bread topping, a delicious mixture of sesame, flax, sunflower, black caraway, poppy and anise seeds. Cherry almond here we come! A sprinkling of raw sugar and into the oven. Once baked I rolled them in some vanilla sugar for the pièce de résistance. Steve and I did a thorough sampling of all four versions. We thought the flavor was deelish and the texture pretty decent. Personally I love the nuttiness and whole grain sense of these doughs and would definitely make whole wheat croissant dough again. I froze a good portion of the baked and cooled end results, and we were able to enjoy the croissants and cheesy spirals thawed and oven warmed with a delicious chili Steve made for a family supper out at cousin Jen’s. Everyone enjoyed them immensely. Who says you can’t have a croissant for supper eh? So what did I learn from all of this? Truth be told, I had done some reading before the project but had neglected to consider the need for some increased hydration when using all whole wheat flour. Duh. Hence I did a thorough read through of very helpful tips and suggestions from the Whole Grain Council/KAF - so much information out there kids! Going forward I now know to add an additional 2 teaspoons of liquid per cup of whole wheat flour used. It’s also important to work the dough more gently and shape more loosely since the germ and bran in the whole wheat flour can actually shred the gluten strands in the dough, weakening it (it was very clear to me with the spelt version that it was drier and much more prone to tearing). Whole wheat doughs generally ferment a bit faster (more nutritive stuff in them for the yeast to munch on) but don’t achieve quite as much volume. I did give my dough the same amount of rising time that I normally give my regular croissants but did note that the rise didn’t appear quite as full. Yet I was very happy with how they baked and tasted in the end. YES indeed. Blend flours, sugar, salt and yeast in the bowl of a stand mixer. Stir in milk (milk/water if using) with a rubber spatula or dough whisk to roughly combine. If using whole wheat flour let the mixture sit for 20 minutes to hydrate before proceeding. Mix with the dough hook on “stir”, adding the 50 g soft butter to incorporate. Increase to speed 2 and knead for 3-4 minutes (2-3 minutes if using whole wheat flour). Place on a lightly floured work surface, cover with plastic wrap and let the dough rest for 30-40 minutes. Shape into a ball, wrap tightly in plastic wrap and place in the refrigerator for at least 8 hours or overnight. Shape the 283 g butter into a 4-5 inch square (I do this between two layers of plastic wrap). The butter should be cool and malleable for the beurrage. Perform the beurrage followed by three business letter folds, resting the dough 30 minutes between each fold. Let the finished dough rest at least 2 hours or up to 12 hours before final shaping. It’s not my intention here to review all the steps and nuances of making laminated dough, proofing and baking croissants but primarily to share the dough recipe. Now it’s time for you to experiment on your own. Go for it! You can do it. 2019 - here we go! Wow! We’re already a full week into 2019, and I’ve baked barely a thing, much less written a blog post. After the busy-ness of the mid-November through Christmas hustle and bustle, I’ve been taking a little stay-cation and easing into the New Year. You know - tidying up the house, putting away holiday decorations, starting some financial summaries for tax time (THAT’S vacation you ask?? ), working on a jigsaw puzzle, going for my walks and contemplating the weeks and months ahead. I recently learned that in France it’s not proper to wish anyone Happy New Year until January 1st and then you have the entire month to express that particular wish. But come February 1st - nuh-uh, not allowed. So I still have plenty of time, right? Happy New Year everyone!! At the start of a new year it’s fun to go back over the past year and look at various projects completed and goodies baked. Here are just a few. Just before Christmas I returned to Sur La Table here in Grand Rapids as Pastry Chef Instructor. So far, so good - macarons, croissants, cast iron desserts (tarte tatin, cherry/chocolate bread pudding, bananas foster) - and more to come in the upcoming weeks. Each month’s schedule almost always has macaron and croissant classes, with seasonal variations in the other baking topics offered. Just visit Sur La Table’s class page to see what’s on the calendar. While the chef instructor schedule isn’t posted until a week ahead, chances are I’ll be teaching a decent percentage of the baking and pastry related classes. Hope to see you there! So what might 2019 bring? As I age and we experience the loss of the generation before us as well as some of our own generation, it becomes more and more clear how important it is to enjoy each day, take care of ourselves, revel in the company of family and friends and remain upbeat about the future and all that we have. As Steve often says “life is short - go to Paris”. And of course, here’s to many new baking adventures (sorghum flour anyone? ), continuing to learn and teach others this craft that I’ve come to love so much. Once again - a big Happy New Year to all! West Michigan is known for it’s grey skies and lack of sunny days during the winter months, but lately I’ve been making a variety of fresh fruit tarts which simply add their own version of sunshine and brightness to the seemingly dreary weather. The good news is when we do have a sunny day, it’s a beauty! And some of our sunsets are absolutely gorgeous. Ahhhh . . . . there’s something about a Michigan sky. While I’d prefer to use fresh local summer berries and stone fruits for my fresh fruit tarts, we’re fortunate to have pretty decent berries coming to us from California as well as citrus and all manner of tropical fruits from various parts of the country and the world. It’s interesting that most requests I receive for fresh fruit tarts happen during the winter months. I guess it’s just that desire for something colorful and delicious, and there’s nothing wrong with that! I love the pinkish-orange of the Cara-Cara variant of the navel orange - just like one of our beautiful Michigan sunsets, especially when paired with the brilliant red of raspberries. And the blackberries lean more toward the end-of-sunset dusk when things start darkening into the deep purple hues of the night sky. The nuts and bolts of this type of tart include a standard pâte sucrée crust, a classic crème pâtissiére and, of course, an assortment of fresh fruit. Whatever suits your fancy. Especially when I’m assembling a large tart, I like to do a mock up of my fruit lay out before actually placing the fruit on top of the crème. Here I’m using raspberries, blackberries, strawberries and Cara-Cara citrus. You might notice the pomegranate seeds at the top - I didn’t end up using them for my own aesthetic reasons (artistic license, right?). I must say that finishing a fresh fruit tart gives one quite a sense of satisfaction. And, of course, one hopes that the recipients will be just as satisfied! Merry Christmas and Happy New Year everyone. Here’s to many more baking adventures! And may you enjoy your own sunsets wherever you are. In preparation for a class I recently taught on making a traditional Bûche de Noël, I did some test runs of the process and created a petite log with a flourless chocolate sponge cake filled with whipped caramel mascarpone cream, coated with medium ganache “bark” and finished off with meringue mushrooms, pistachio moss and a dusting of powdered sugar snow. FYI - all of this just happens to be gluten free! When making one of these babies, organization and planning are essential. The good news is pretty much all of the components can be prepared ahead. Meringue mushrooms will hold for a couple of weeks if kept in an airtight container in a non-humid environment. Bake the cake, fill and roll it a day or two ahead then finish up with glazing or frosting the log and completing the garnish the day you plan to serve. Cool! I’m not here this time to share specific recipes with you but to simply encourage you to do some research and come up with what works well for you. HINT: Prueitt and Robertson’s Tartine and Rose Levy Beranbaum’s The Cake Bible are two great places to start. And if you really want some inspiration, check out this link to some of the Bûches de Noël in Paris this season. It’s an entirely different world out there folks! Below is a view of the table where four talented bakers created their own versions of the traditional holiday yule log. It was lots of fun plus everyone was able to take their end result home. Yay! A big thanks to those who participated in the class. It’s that time of year folks! Now that Thanksgiving is behind us, it’s time to focus not only on holiday cookie assortments but other seasonal treats as well. So many options - how does one decide?! Check out the menu page for this year’s holiday treat offerings. There’s a nice mix of all-butter shortbread cookies to choose from, each flavor packaged in individual tubes. What wonderful treats to tuck into goodie baskets or stockings. Or choose your favorite 2 or 4 flavors to go into a holiday ribboned gift bag - a great way to give a little something as a hostess gift or to delight your friends and co-workers. On the non-cookie side of things, try out this delicious crispy bark made with Guittard 61% chocolate, toasted sliced almonds and my own caramelized puffed rice - oh so good! Packaged in 5 ounce gift bags, it’s a great addition to any holiday foodie assortment. And - get this! It’s gluten free and vegan to boot!! For something a little more special, check out this limited edition cookie box filled with 4 different buttery treats: citrus snowballs, cocoa hazelnut drops, almond raspberry thumbprints and English toffee shortbread. Oh my. Simply packaged for the season, it’s a delicious way to make someone in your life feel extra special. Here’s to a non-stressful, happy and healthy holiday season! Thanksgiving is fast approaching and now’s the time to decide what you’d like on your holiday dessert table! Visit the menu page for all the details for this year’s tarte offerings. For those of you in the greater Grand Rapids area, orders will be accepted through Saturday, November 17 so don’t forget to add it to your to-do list! This year I’m offering pumpkin custard with sesame crunch, pecan caramel chocolate truffle and apple cranberry with brown sugar crumble in both 9-inch and my “sharing” 5.5 inch size (seen in the photos above and below) for those of you who might prefer petite portions or are hosting or joining a smaller group for the holiday this year. Let’s take a look at how these babies are put together, shall we? BTW - even though the images depict smaller tarts, the discussion is for making standard 9 inch tarts. First up is pumpkin custard. Use your favorite pate sucrée recipe and add about 30 g toasted sesame seeds at the end of the dough prep. Blind bake the crust at 350ºF and set it aside while preparing the filling. Note: tart dough recipe is enough for two 9” tarts - wrap and freeze any extra for another time. Reduce the oven temperature to 325ºF. Make your favorite crème pâtissiére, adding 1-2 teaspoons or so of pumpkin pie spice mix (I use my own made-up mixture of spices) to the milk base. At the end of cooking blend in 1 cup pure pumpkin purée, 4 tablespoons of butter and two teaspoons vanilla extract. This base is more than enough for one 9 inch tart but you can use leftovers to make a bunch of mini-tarts or fill cream puffs. You can even divide what’s left into ramekins and bake them in a water bath for a lovely pumpkin custard for after the holiday. Fill the blind baked tart shell with the warm pastry cream, just barely shy of the rim and bake for about 20 minutes until set with a hint of a jiggle in the center. I did several test batch sizes as you can see below. Let cool then store covered in the fridge until ready to serve. In my case I garnished with whipped honey mascarpone cream and a sprinkling of sesame crunch. For a slightly different approach, change out the sesame seeds in the tart dough with toasted, finely chopped hazelnuts, almonds or pecans and use the same nut as a simple garnish with lightly sweetened whipped cream. Or simply leave out any dough additions and create your own version of topping. Next up - pecan caramel chocolate truffle tart. And remember - this is for a nine inch tart. The approach is much the same: blind baked pate sucrée, cooled and waiting on the sidelines. For a chocolate crust, just add 30 g (~1/3 cup) unsweetened cocoa powder to the flour in the recipe. Toast 100 g/scant cup pecans and either leave the halves whole or break them up coarsely. Blend them with a scant 2/3 cup caramel sauce (I make my own, although you can use a good quality purchased product from your local supermarket or specialty food shop). Place 85 g dark chocolate (I use Guittard 61% discs) and 21 g unsalted butter in a heat proof bowl. In a separate heat proof container (I use a pyrex measuring cup) bring 120 ml heavy cream to a boil. Pour over the chocolate/butter and blend gently until smooth. Blend in 3/4 teaspoon pure vanilla extract. Note: double or triple your recipe to have more ganache on hand for your next truffle tart project! Layer the nut caramel mixture in the bottom of the baked shell. Once again I made some small trial versions - for taste testing, don’t ya know?! Pour the ganache over - start slowly to let it nestle into all the nooks and crannies and continue pouring until it’s to the rim edge. Some bubbles will invariable pop up to the surface - just pop ‘em with the tip of a paring knife. Leave at room temperature until the ganache has set and cooled. If you put it in the fridge before that, there’s a greater chance that beads of moisture will form on the surface - you don’t want that! Once cooled you can go ahead with any garnish or cover/refrigerate and garnish later. I top mine with chocolate shortbread cookie crumbs, a light dusting of confectioner’s sugar and a few pecans in the center. Pull the tart from the fridge 30-60 minutes before serving to let it temper and bring out the flavors more fully. Feel free to add a dollop of lightly whipped cream atop each portion. Last but not least - apple cranberry! A straight forward pâte brisée dough filled with a mixture of lightly sweetened sliced apples and dried cranberries and topped with a brown sugar crumble. Heat the oven to 425ºF. I typically line my tart rings, fork-prick the dough and hold them in the freezer while preparing the fruit. For a nine inch tart I plump 100 g dried cranberries in warm apple cider for 20 minutes or so while I peel, core, halve and thinly slice 4-4.5 cups of Jonagold apples (another good mix is Macintosh and Granny Smith). Drain and paper towel dry the cranberries and mix the fruit with a squeeze of lemon juice, 1/4 cup sugar (use brown if you’d like) and 2 tablespoons of flour. Then I mound the fruit into the lined ring. In this case Mr. Steve had reduced down a bunch of apple cider for me, creating a delicious apple cider caramel. I drizzled some of that on the fruit once the lined ring was filled. Yummy stuff. Top with a standard crumble mixture of equal weights flour, brown sugar (light or dark is fine) and diced butter and cover the fruit with the mixture. Not a very thorough covering job on those small tarts, eh? As I’ve mentioned in previous posts over time, I like to make a bunch of crumble, bag it up and stash in the freezer where it’s at the ready to be used. Bake on the bottom rack for 10 minutes then reduce oven temp to 400 and move up to the middle rack. Give it another 10 minutes then ratchet down to 375 and continue baking for another 10-20 minutes (all ovens are different so pay attention!) until the crumble has browned and you see some bubbling around the edges. Cool a bit and serve slightly warm or at room temp with your favorite ice cream or whipped cream. Yippee! And there you have it! A delightful trio of seasonal tarts just waiting for the Thanksgiving table. Have a calm and peaceful holiday everyone. Meanwhile here in west Michigan there are lots of rustling leaves along the pathways and the burning bushes are still burning brightly, even though many trees are now bare. Tis the season - and we may even see our first snow this weekend. Oh boy, oh boy! Here’s a wonderful way to use puff pastry. Make vol au vent (puff pastry cases) in desired shapes and create your own sweet and/or savory fillings for your supper buffet or dessert table. 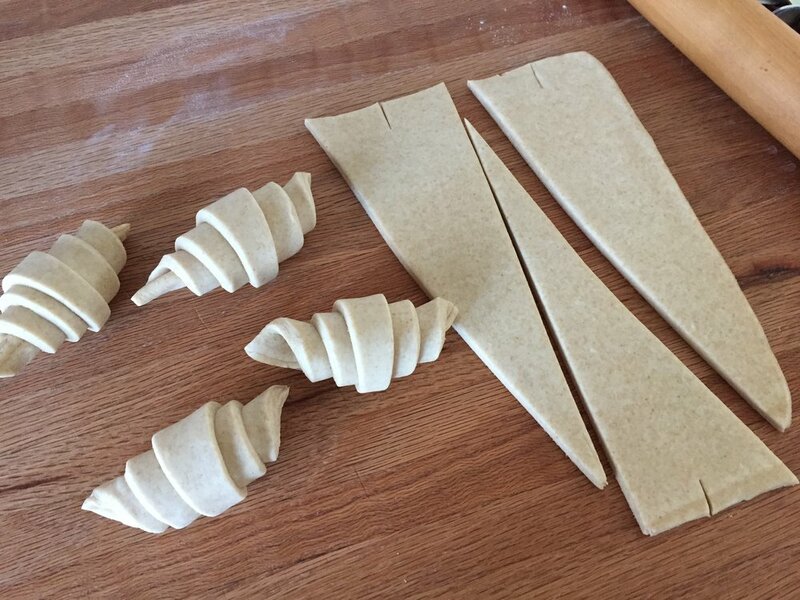 While making your own puff pastry is a rewarding experience, the good news is you don’t have to! All butter puff pastry (Dufour is a well known brand) is available in the frozen food sections at many local supermarkets, allowing you to take one task off your holiday prep to-do list. Before you know it, Thanksgiving and Christmas will be upon us, so start planning now. This version of vol au vent (also referred to as feuilletée) marries sweet and savory tastes and, since I’m still on the trail of baking with cheese projects, I chose Irish Cashel blue cheese from The Cheese Lady as a lovely accompaniment to pears, walnuts and honey. 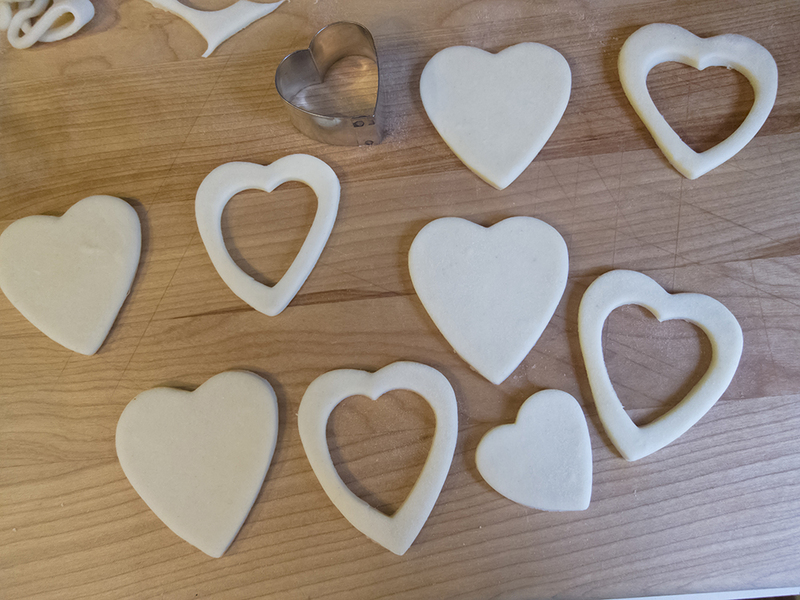 If you happen to have a stash of different shaped cutters, choose your favorite shapes (I like ovals, squares, hearts and fluted rounds) and use cutters that are two sizes apart. For each puff you’ll cut two shapes with the larger of the two and then cut the center out of one of them with the smaller. Once you do it, you’ll know what I’m talking about. Here’s a heart version which should help you visualize the process. Brush a little water along the edge of the solid shape then lay the cut out on top of it. Just press gently to stick them together. The top layer serves as a border for the puffs. You can save the cut out shapes and bake them along side - they make cute “hats” on your finished creation or you can just eat them plain. These bake at 400ºF for 15-20 minutes until golden brown. Let them cool a bit, push down the center layers that have puffed up to give yourself room for the chosen filling. NOTE: Another plan-ahead perk is you can bake your puffs a week or so ahead and freeze them. When you’re ready to start your filling project, take them out of the freezer, place them on a parchment lined sheet pan and heat the oven to 325ºF. Pop them into the heated oven for 5-10 minutes to crisp them up then set on a cooling rack while you prepare your fillings. I’ve created these delights with poached Bosc pears on hand in the fridge, but another approach is to roast pear slices drizzled with honey for the pear portion of the program. Peel, core and slice the pears, drizzle them with honey and roast them in a 375ºF convection oven for 10-20 minutes. Stir them up a bit half way through. You want them turning golden but still holding their shape. Once the pears have cooled you can store them in a covered container in the fridge for several days. Then tuck in the pears (don’t be afraid to mound them up!) and top with a sprinkle of walnuts, more cheese and a drizzle of honey. Then pop them back into the oven to melt the cheese a bit and warm things up. They can be served warm or at room temp and are delicious as an appetizer or a dessert, particularly if you’re doing a broader cheese board for the end of your meal. Use your imagination and fill your puffs with anything savory or sweet. Crab or chicken salad, roasted root veggies with caramelized onion, lemon curd and fresh berries, whipped chocolate ganache and candied nuts. The sky’s the limit. Happy baking and here’s to the holidays!! More on that coming your way. Ooooh I loved this baking adventure! Not only did I use Fontinella, a delicious bread-worthy cheese from The Cheese Lady, but added in some roasted garlic that the Steve-man has recently been providing in spades. I’ve been wanting to experiment more with different ways of filling and shaping bread dough and am often inspired by ideas I absorb from King Arthur Flour’s “Sift” magazine and/or their website which is chock full of wonderful tips, tricks and ideas. In addition, I’m learning more about the ways to tweak one’s bread recipe from a straight or direct dough to a pre-ferment approach to build more flavor into the final result. Not only is it fun but appeals to my scientific bent. In addition to KAF’s website, my go-to resources for bread baking include Rose Levy Beranbaum’s “The Bread Bible”, Peter Reinhart’s “artisan breads every day” and Jeffrey Hamelman’s “Bread”. So much to learn. For this project I married ideas from a provolone bread recipe from CIA’s “Baking and Pastry” that I’ve been making for some years now with a KAF recipe for a cool looking twisty cheese/sundried tomato/herb number. I wanted to do a poolish this time and found some great tips on the “Weekend Bakery” blog, written by a Dutch couple who bake at their home. Lots of good stuff there too. I’m not here to slog through the calculations but, in a nutshell, a poolish is equal weights of flour and water taken as a percentage of the whole from the base bread recipe you’re using. Based on my understanding of how one goes about this, I created my poolish with 200 g bread flour, 200 g water and 1/8 + 1/16 teaspoon of instant yeast, looking for a 6 hour room temperature fermentation. NOTE: the amount of yeast you add will vary depending on how long you wish your poolish to ferment. Here’s my poolish after about 5.5 hours - nice and active and bubbly! To make the final dough I combined the poolish with 510 g bread flour, 7 g instant yeast, 235 ml tepid water/milk mix, 71 g olive oil, 20 g butter and 16 g salt. Using the dough hook I mixed everything for 4 minutes on low speed and then 2 minutes on medium speed. Then a 30 minute bulk fermentation followed by a fold-over then another 30 minutes before dividing. I divided my dough into two 740 g portions with a plan for two different shaping approaches. The first shape involves rolling the dough into a rectangle and sprinkling it with 227g grated cheese (fontinella in my case). Then I took 6-7 cloves of roasted garlic and smooshed and pieced them up, scattering the pieces over the rectangle. A light sprinkle of Penzey’s salt free pizza seasoning mix, then roll up a snug log. Once the log is complete, pinch the seams, place it seam side down on a parchment lined sheet, slit it down the middle to a depth of about an inch, leaving the ends intact. The log will open up to expose the filling. Then shape it into an “S” and tuck the ends under. Pretty cool. My second shape followed the method used for babka in which you roll up the log as already described, then slit the log entirely down the middle yielding two separate pieces filling side up. Begin at one end and twist the two pieces over and under each other, continuing to keep the filling side up as best you can (I could use some more practice on this one!). In this case I then went for a couronne or crown by forming it into a ring and tucking the ends under. Cover and let rise in a warm place for about 45-60 minutes, heating the oven to 350ºF during the last half of the rise. Bake for 35-40 minutes until nicely browned. The fontinella and roasted garlic went a long way to making this one a truly delectable bread experience. For a family supper we sliced it, drizzled some melted butter over it, loosely wrapped it in foil and warmed it for about 10 minutes in a 325ºF oven. Oh my. Yup. I’d make this again. How many of you knew that October 12 was World Egg Day? I wouldn’t have known if it hadn’t been for Kim, the activities director at Heron Manor/Woods just down the street from our home. It all started in 1996 when the International Egg Commission set the second Friday in October as World Egg Day to increase awareness of the benefits of eggs and how important they are in human nutrition. Who knew? Needless to say, eggs are utilized in many different ways in the baking and pastry world. For a morning event this past Friday, October 12, I decided to really go for it in the egg department. Never one to turn down pot de crème, I thought others would enjoy a maple version of this unctuous delight, topped with maple mascarpone cream, a sprinkle of walnut praline crumbs and a petite maple walnut shortbread cookie on the side. So lovely and so delicious. The base is essentially a crème brulée type custard made with cream, yolks and sugar (maple syrup here). I used 3 ounce ramekins which I find to be a perfect portion for a just right taste. To yield 14 portions, whisk together 9 yolks, 3/4 cup REAL maple syrup (don’t you even dare use “pancake syrup“! ), 3/4 teaspoon salt and 3/4 teaspoon vanilla extract; heat 3 cups heavy cream to barely simmering and temper it into the egg/maple syrup mixture. Strain through a fine mesh sieve into a pouring measuring cup then fill the ramekins to 1/4” below the rim. Bake in a water bath at 325ºF. I use a clear pyrex glass baking dish, set the ramekins in, pour hot water into the corner of the dish and fill to about half-way up the sides of the ramekins. Cover loosely with foil and bake about 30-35 minutes, checking it periodically - you want the custard just set with a hint of a jiggle in the center. Once out of the oven, lift them out of the water bath and cool to room temperature on a wire rack. Then refrigerate until chilled. Garnish with whatever you’d like! If not being consumed the same day, I cover them with plastic wrap to enjoy over the next few days. As always, having some version of a tart in the mix is right up my alley and thus a ricotta custard raspberry tartlette was born - buttery blind baked short crust filled with a few raspberry pieces and an easy to make ricotta filling. For the filling whisk together 2 cups ricotta/3 eggs/one tablespoon cornstarch/3/4 cup sugar/zest of a lemon/ 1 teaspoon vanilla. Et voilà, très simple! Bake at 350ºF until the filling is set and a bit puffy, about 20-25 minutes. To give these babies some panache I made a lightly gelled raspberry coulis and pooled it on the top. Then a nice string-of-pearls crème Chantilly rim and a fresh raspberry to top it off. Smooth and berry delicious ! The World Egg Day table also held browned-butter pistachio crumb cakes (egg whites) . . . .
. . . . and apple pecan brioche (we all know that has eggs!). Note: more on revisiting brioche recipes later - it’s an ongoing task. An enjoyable egg day it was!! Can’t wait until next year. Yippee - it’s officially fall! The recent autumnal equinox dawned bright, crisp and clear with morning temps in the mid-40s, perfect for walking, baking or pretty much anything one might feel like doing. My time of year! Apples are everywhere - farmers markets, grocery stores, orchards and farm stands - and one can choose the pick-your-own thing or simply buy your favorite of the many varieties available here in west Michigan. Having a go-to simple apple tart in one’s repertoire is a beautiful thing. As is my practice, I periodically assess my freezer stock of various doughs and decide when it’s time to use something up. This time it was one of the pâte sucrée doughs that I like to use for rustic galettes. The approach is very straight forward, not unlike the Provençal tomato tart I just wrote about, although this time there’s no blind baking involved. Gotta like that. First line the tart rings. In this case I’m making four 100 mm/4 inch diameter tarts, just enough to share with a few folks for dessert. Once lined, I sprinkle a mixture of equal parts sugar/flour (almond flour or fine bread crumbs work too) on the bottom to protect against sogginess from juicy fruit. With apples it’s not as much of an issue as it might be for juicier fruits like berries or stone fruits, but it’s a good practice nonetheless. If I happen to have some diced/sautéed apples on hand, I put a smattering of those into the tart shell too. For the remaining apple filling I thinly slice a few medium apples and toss them with some vanilla sugar (1/2 to 1 tablespoon per cup of apples, or to taste). You can switch to brown sugar if you prefer that bit of toffee like essence. I generally keep the apples as the centerpiece of flavor and forego adding cinnamon or other spices, but those are popular options with many apple tart/pie bakers. You decide. I’ve used a number of different apples over the years and love the combination of Jonagold/Fuji or Granny Smith/Macintosh. During my internship in Paris back in 2007 Chef Pascal Pinaud used Golden Delicious for his apple tarts, and they were mighty fine too. Isn’t it fun to experiment? NOTE: a pound is about 3-4 medium or 2-3 large apples and should yield 3-4 cups. That worked well here with a handful of slices left over. I go for the more the merrier, especially since I like to pile ‘em on. I drizzle a little melted butter over the apples then pop the tray into the freezer while I heat the oven to 400ºF. Start the bake on the lower rack for 10-15 minutes, then move up to the middle rack, turn down to 375ºF and bake for another 10-15 minutes. Some of the apple slice tips start turning brown and I’ll begin to see some juiciness and bubbling developing along with the lovely aroma of baking apples and nicely browning crust. At this point I’ll often turn down to 350ºF and give them another 10-15 minutes. In a nutshell I typically plan a 35-40 minute total bake time for these tarts. Once out of the oven I drizzle my homemade caramel sauce over and give them 3-4 minutes more in the oven to set the caramel. Served with vanilla ice cream (Steve believes everything is better that way), these were a tasty end to the meal. Très délicieuse! Here’s to many more autumn baking adventures!! Wow this was good! Steve and I enjoyed this freshly baked, slightly warm tomato tart along with grilled chicken and fresh green beans. A delicious late summer meal. Since tomatoes are out in FORCE right now I decided to make this Provençal tart, ramping up the cheese to include both Swiss cave-aged gruyère and a crumbling type chevre from Pélussin France, located in the Loire department just south of Lyon. Once again, thanks to The Cheese Lady here in Grand Rapids MI for a great selection of cheeses. This tart is one of those things that you can play around with, changing up the herbs, the cheese, the amount of mustard, even the size and type of tomato. It’s a simple approach - a blind-baked pâte brisée crust, a schmear of Dijon mustard and a layer of grated cheese all topped with slices of garden fresh tomatoes seasoned with a little salt, pepper and your choice of herbs. I added some dabs of goat cheese on top just to give it that certain something. Then it all goes into the oven. Let’s go through the steps OK? First line the tart pan with tasty pâte brisée. Once lined and pricked all over with my trusty fork, I place the tart pan on a parchment lined sheet pan and freeze it for 15-20 minutes while heating the oven to 425ºF. Once firm, it makes it much easier to line it with a round of parchment and fill it with dried beans for blind baking. Now bake it on the lower rack for 10 minutes, turn the heat down to 400º, move it up to the middle rack and give it another 5 minutes. Take it out of the oven and remove the weights. The crust should be starting to set although the bottom will be a bit moist and doughy and will need a bit more baking to finish it off. Pop it back into the oven without the weights and give it another 5-10 minutes until golden brown. I often decrease my oven temp to 375 for this step and, as usual, keep on eye on what’s happening in there. Decrease the oven temp to 350º. While the crust cools, thinly slice 2-3 fresh, ripe medium tomatoes, grate up a cup (about 4 ounces) of gruyère and have some Dijon mustard at the ready. I like to blend some regular Dijon with a nice coarse grainy mustard, 2-3 tablespoons total. Maille is a great brand and, if you’re in Paris, you can visit their wonderful shop right near Place de la Madeleine. Spread a thin layer of mustard over the bottom of the cooled crust. I used 2 tablespoons since I like a more subtle mustard flavor, but you can certainly use more if you wish! Sprinkle the grated gruyère over it. Arrange your tomatoes in concentric circles, overlapping each slice. I also tucked in some halved orange and dark red cherry tomatoes for some additional color. It’s pretty traditional to finish off these tarts with salt, pepper, fresh herbs and a drizzle of olive oil before baking, but I went for an addition of crumbled goat’s cheese dotted over the tomatoes. Then some freshly grated black pepper, a pinch of two of salt, a sprinkling of herbes de provence and it’s ready to go into the oven. Bake it for about 20-25 minutes until the goat cheese is starting to brown, the tomatoes are starting to shrivel and the aroma is hitting your nostrils just so. The combo of nutty gruyère, warm fresh tomatoes, the tangy, creamy goat’s cheese and the perfect hint of mustard and herbs was absolutely delicious. Not only that, it’s très, très facile. You can do it! This one’s a keeper, right Steve? These delectable whole wheat shortbread-style cookies (biscuits for you Brits out there) have just the right hint of sweetness, chock full of toasted nuts, dried fruit and oats. You can read more about the recipe here. Since I wrote about these back in February, I've settled on three flavor variations as an accompaniment to cheese, either as an appetizer or as part of the post dinner cheese course. Cherry hazelnut, apricot pistachio and cranberry almond. Lovely. A few weeks back I paired these gems with a mellow, dreamy Saint Angel triple crème from The Cheese Lady here in Grand Rapids. While the cheese is exactly what it should be - buttery, smooth and oh-so-good - it was rather lost when spread on these wholesome biscuits. So I decided to try something a bit more bold and nutty for this episode in my baking-with and pairing-with cheese project. So back to The Cheese Lady I went. This time I went with a couple of Spanish cheeses, one bleu from the Basque region and one 12 month aged Manchego, both of which just had to be given the chance to show their stuff. The nuttiness of the aged Manchego wasn't bad with the crunchy-little bit chewy-fruity-nutty cookies, but it was the bleu that really shined for me. Salty and pungent yet smooth and creamy - I'll take it! Alas, while the Steve-meister loves cheese, especially bleus and Manchegos, he couldn't quite get on board with the cookie part (not a shortbread lover - sigh). He'd go for a crispy cracker instead - to each his/her own, right Mr. Steve? Stay tuned for more cheese adventures! This post is quite a mouthful (get it?) but here goes! I've been experimenting in recent weeks, tweaking my tried and true croissant recipe in hopes of reaching the ultimate croissant perfection. Invariably I've had some croissants leftover, some of which were destined to become croissants aux amandes, one of Steve's (and many others by the way) favorite pastries. But that's not the only way to repurpose this lovely laminated goodie - bread pudding here we come! Here I'm using a 3 qt Pyrex casserole dish, lightly buttered, layered with about 400 g/14 ounces of chunked up croissant pieces. It's actually better to use "old" croissants for this purpose, since the dough is able to soak up the custard much more efficiently. The custard is one I love to use for baked fruit tarts too. I wanted a filling quantity about twice the weight of the croissants and doubling my base recipe worked out perfectly. Love it. I typically plan ahead, giving my croissant/custard mélange a good couple of hours to soak in the fridge before baking. Then I topped this one with about 3 cups of blueberries, tucking them down into the custard a bit, followed by a sprinkling of raw sugar for a little extra crunch. Bake at 350ºF for a good hour to an hour and twenty minutes - you want the custard nicely set and the croissant pieces toasty brown. Just be patient. Trust me. Destined for the dessert table at our Labor Day outing at cousin Jen's, I added a couple of complimentary summer ice creams that I must say were pretty fun to make. BTW - I LOVE making ice cream, in case I haven't told you heretofore. I've been using a classic custard type base from David Lebovitz for many years now and never find it wanting. Just omit the vanilla bean from the base recipe when you're creating your own flavor(s). First up - roasted plum almond. Dairy infused with toasted almonds (which are then strained out) . . . . .
the finished chilled ice cream base blended with about a cup of roasted plum purée then processed. It just takes some planning, as is true of so many things in the kitchen, right? The roasting fruit thing has been another of my summer experiments, and since I'm invariably contemplating ways to preserve our wonderful summer fruit bounty here in west Michigan, why not give it a try. The idea behind the roasting is to concentrate the flavor more. It's quite simple really. Heat your oven to 400ºF (or 375º convection), prepare your fruit depending on size (e.g peaches sliced, plums or apricots halved and pitted and maybe quartered too, cherries pitted, berries left whole - just play with it). Place fruit on a parchment lined sheet pan and roast about 10 minutes. Give them a stir and roast another 5-10 minutes. The fruit should become softened, a bit caramelized and shrunken looking. Since I planned to purée mine, I didn't really care how shrunken they became. My plums were a red-skinned, yellow-fleshed variety which I placed skin side down on the prepped sheet pan. You can roast your fruit au naturel or drizzle a little honey over it if you'd like. As a side note, a pound of plums (~6 medium or 9 small), halved, pitted, roasted, puréed and strained should yield about 1.5 cups of purée. Of course, you don't have to do the roasting part - just leave that step out of the above, and the un-roasted purée yield should be a bit higher. Once roasted, the fruit will keep in a closed container in the fridge for a few days or frozen for several weeks. I froze mine and did the puréeing later - just thaw in the fridge overnight, purée, add a tablespoon of lemon juice, a pinch of salt and sweeten to taste. I generally start by adding sugar equal to 10% by weight of the purée and add more if it's still pretty tart. Then use it in whatever way you choose. Maybe swirled into a cake batter, blended into mascarpone cream, warmed and used as a sauce over a nice berry cake. You decide. The second ice cream - sweet corn! In this case, using the same base recipe mentioned above, scald the milk with half the sugar and a pinch of salt, temper it into the yolks which have been whisked well with the other half of the sugar, then whisk in 2.5 cups of fresh corn cut off the cobs plus the two cups of cream. Bring this all to a boil (the starch in the corn protects the yolks from curdling, just like making pastry cream with cornstarch!). Then put it all in a decent blender (I have a Breville brand which is dyn-o-mite), purée and strain then chill thoroughly before processing. YUM. And there you have it - blueberry & croissant bread pudding with sweet corn and roasted plum ice cream on a polka dot paper party plate. Happy summer! It's official! I'm now offering small group hands-on pastry classes at Nonna's Pantry in Ada. Check out the fall schedule here. I'm excited to have a space in which I can share my craft with beginners and avid bakers alike. Even though we're still in the throes of summer heat, humidity, showers and thunderstorms, fall is coming and it's baking season. Yay!! I look forward to seeing some of you at Nonna's this fall. Meanwhile, happy baking to all.